Reap the time-saving, mistake-avoiding benefits enjoyed by thousands of chemical and process design engineers, research scientists, and educators. 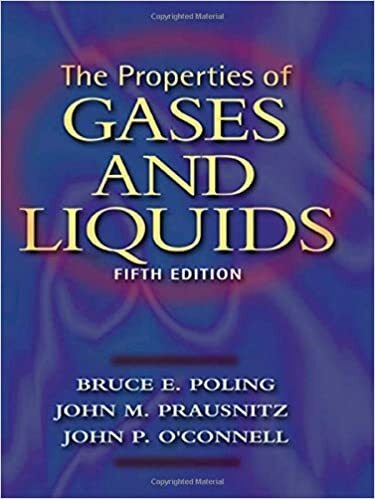 Properties of Gases and Liquids, Fifth Edition, is an all-inclusive, critical survey of the most reliable estimating methods in use today --now completely rewritten and reorganized by Bruce Poling, John Prausnitz, and John O’Connell to reflect every late-breaking development. You get on-the-spot information for estimating both physical and thermodynamic properties in the absence of experimental data with this property data bank of 600+ compound constants. Bridge the gap between theory and practice with this trusted, irreplaceable, and expert-authored expert guide -- the only book that includes a critical analysis of existing methods as well as hands-on practical recommendations. Areas covered include pure component constants; thermodynamic properties of ideal gases, pure components and mixtures; pressure-volume-temperature relationships; vapor pressures and enthalpies of vaporization of pure fluids; fluid phase equilibria in multicomponent systems; viscosity; thermal conductivity; diffusion coefficients; and surface tension.